Staying active means looking after your feet, so check out our sports footwear retailers to find a pair of shoes that will get you the most benefit. * Overall satisfaction is an individual rating and not a combined total of all ratings. Brands with equal overall satisfaction ratings are listed in alphabetical order. Hollow star ratings are awarded where brands do not receive the minimum number of responses for that criteria, however achieve at least the minimum sample required for all other criteria. Looking at eight different brands in these results, Shoe Clinic was fastest off the mark – receiving our Most Satisfied Customers Award – Sports Shoe Retailers, 2014. Would you rather be fit, fashionable, or thrifty? Many consumers are more than likely to be all three, according to those who recently shopped at a sports shoe retailer. 44% of our survey respondents update their sports shoes regularly, so they can perform at their best. 62% factor colour and design into their decision, because they want to be considered “fashionable”. 36% say price is more important than shoe functionality / performance. This is especially true for men (42% agreed as such, versus 29% of women). Speaking of price, a reasonable proportion of New Zealanders are happy to trade personalised service for price, with nearly a quarter of shoppers buying shoes online at a cheaper cost … after trying them on in store beforehand. At least a quarter do say they buy sports shoes online from New Zealand retailers. Hearteningly for bricks and mortar stores, around 88% still like to buy shoes face to face, with 75% of respondents enjoying the specialised service from a physical shoe store. So there’s value in shopping both online and in store – but where should you go? We surveyed sports shoe shoppers, both those who shopped online and those who shopped in store. Looking at eight different brands in these results, Shoe Clinic was fastest off the mark – receiving our Most Satisfied Customers Award – Sports Shoe Retailers, 2014. They did so with five star ratings in overall satisfaction, customer service, and its range of accessories. 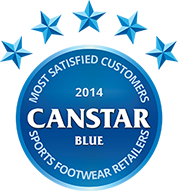 Smith’s Sports Shoes received five for its shoe /brand range. Our full results are available in the table above. Canstar Blue commissions Colmar Brunton using the SSI panel to regularly survey 2,500 New Zealand consumers across a range of categories to measure and track customer satisfaction. The outcomes reported are the results from customers within the survey group who have purchased sports footwear from a New Zealand retailer in the last 12 months (online or physical shopfront) – in this case, 949 New Zealanders. Shoe Clinic provide the low down on a good sports shoe fit, and when the right time is to retire your favorite pair of sneakers. Here are some tips on how often we should be replacing our sports shoes. Auckland aims to be the world’s most active city by 2020. When it comes to buying a sports outfit, the shoes on your feet are surely the most important piece. Who – or what – is Les Mills?